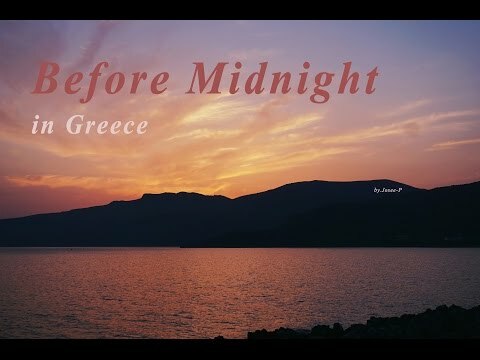 Before Midnightis a 2013 American romantic drama film , the third in a trilogy featuring two characters, followingBefore Sunrise(1995) andBefore Sunset(2004). It was directed by Richard Linklater and stars Ethan Hawke and Julie Delpy . Co-written by Linklater, Hawke and Delpy, the film picks up the story nine years after the events ofBefore Sunset; Jesse (Hawke) and Céline (Delpy) spend a summer vacation together in Greece . Following a limited opening in May, the film was released wide in June 2013 and grossed over $20 million worldwide. As with the second entry of the trilogy,Before Midnightreceived widespread acclaim and was nominated for an Academy Award for Best Adapted Screenplay . Some elements were drawn from the screenplay for the first film. Nine years have passed sinceBefore Sunset. Jesse and Céline have become a couple and parents to twin girls. Jesse struggles to maintain his relationship with his teenage son, Hank, who lives in Chicago with Jesse's ex-wife. After Hank spends the summer with Jesse and Céline on the Greek Peloponnese peninsula, Jesse drops him off at the airport to fly home. Jesse is a successful novelist, while Céline is at a career crossroads, considering a job with the French government . The couple discuss their concerns about Hank, and then about Céline's choices for her career. Over dinner they talk more about love and life. Friends staying with them pay for a hotel room so they can have a night alone. While walking to the hotel, the couple reminisce about coming together. After reaching the hotel, they have a fierce argument, expressing fears about their present and future together. Among other issues, Jesse wants them to move to Chicago so he can be closer to Hank, which Céline thinks will cost her any chance of a life outside her family. In the heat of the argument, Céline tells Jesse she no longer loves him. Céline leaves their room and sits alone in the hotel's outdoor restaurant. Jesse joins her and jokes that he is a time traveler bringing her a letter from her 82-year-old self, describing this night as one of the best of their lives. Unamused, Céline says their fantasies will never match the imperfect reality. Jesse proclaims his love, saying he does not know what else she could want. After a moment, Céline joins in Jesse's joke, and the two seem to reconcile. // Before Midnight, 비포 미드나잇 예고편 5960 views runtime : 0:00:00 비포 미드나잇 예고편,..